Manon Carpenter won the World Cup title in Meribel, France, on 23 August 2014. Manon Carpenter has added the Mountainbike Downhill World Championship title to the World Cup title she won last month. 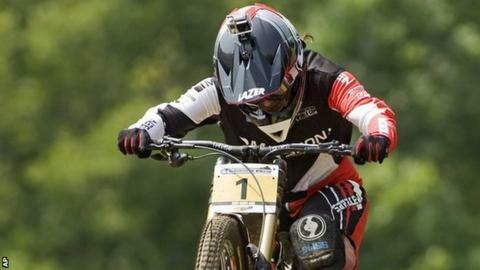 The 21-year-old Welsh rider finished 0.088 sec ahead of Wales-based Rachel Atherton, who was quicker over the top part of the course in Norway. Tahnee Seagrave finished behind Atherton to complete a British 1-2-3. "I'm really happy. I didn't expect it to happen so it's a really nice a surprise," said Carpenter. The Caerphilly rider was crowned World Cup winner on 23 August after winning three of the seven races in the series. Carpenter admitted she's had a little trouble re-applying herself after winning the World Cup. "I was pretty wired for a while and couldn't sleep and was excited all the time, so I had to tell myself to cool down because the world championships were coming up," she added. Carpenter also had to endure watching her nearest rival Atherton ride last while she waited at the bottom of the course. "I was sat at the bottom and she was up at the first split by a second. "When she jumped the bridge near the bottom I knew there was roughly 10 seconds from there to the finish line so I knew it was going to be close. "I thought she was going to have it to be honest, and when I saw the screen was red and she went into second it was a relief."